Blinking of advertisements is kind of event which is rarely liked by users and especially when you are in the instant messenger; nobody likes to be distracted by the ads. Ads on the IM also many times have the potential to contain adult product content which you might not to see when you are chatting in office or in front of others. 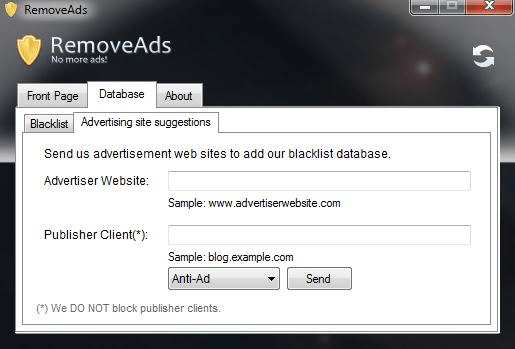 To kick out this problem, you can make use of ‘RemoveAds’ application which is a Windows program which enables you to remove any unwanted ads on your IM. Download the application from this link and install it on your system. Launch the application by moving to the start menu and by searching for the RemoveAds application. You will see the above screen when you successfully log the application. Here enter the required information like Advertiser website and other details. Click on the send and this will blacklist the advertiser from posting ads on your IM. Maintenance of this app is quite easy and all you have to take care is, adding of newer ad website which you want to block. So simply install this application and enjoy the ad free IM environment.